My interest in utilizing goat milk for health led to my accidental discovery of its benefits for skin care. Once I started using dairy and other natural products on my face, I stopped buying all commercial products because the results were SO much better--and, do I even need to say it--SO much less expensive! In fact, several times when I've passed by the television and heard an infomercial on some "remarkable, new discovery" for a facial cream, I had to just stand and shake my head as I listened to their "incredible" results. Of course, these discoveries also come with an "incredibly" high price; however, I have no doubt at all from my experience and research that an all-natural skin care routine is more effective than any of their expensive creams. I actually get a little upset that the cosmetic companies are making huge amounts of money by creating poor imitations of what's available naturally--and naturally affordable by almost anyone! 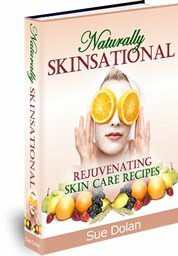 Naturally Skinsational Rejuvenating Skin Care Recipes Ebook! The ebook is a total guide to using all-natural products for skin care. Whether your concern is with anti-aging, wrinkles, age spots, acne or just healthy skin maintenance, Naturally Skinsational has a recipe for it. Furthermore, "Skinsational Tips" featured throughout the book provide short, interesting skin care facts, and a natural ingredient glossary at the end of the book explains the benefits and uses of each ingredient. With all the information provided, you can easily go beyond the 150+ recipes included in the book and learn how to tailor a skin care regimen JUST for your special skin care needs, and with ingredients that you have available. And, if you're looking for more ways to use goat milk for homemade facials, Naturally Skinsational has over 40 recipes that include dairy products! Dairy products--especially goat milk--are one of the oldest known beauty treatments, and these recipes increase their power by combining them with other natural substances with specific skin rejuvenation properties. Natural skin care has been part of my life for over a year now, and I would never go back to helping the cosmetic companies get rich from their overpriced, inferior products, when I know that everything I need for beautiful skin is in my kitchen! If you're ready to "toss the tube" and try natural skin care methods, Naturally Skinsational for only $19.95 is a great way to take charge of your skin and your pocketbook! A portion of the sales of Naturally Skinsational from the links on this page supports the costs of running this website and providing the free information available through it. I support only affiliate advertisers and products that I know are superior quality and are beneficial to visitors to this site.